Remember me? I was the brand new mom that you accosted in the formula aisle. I sobbed as you told me why I shouldn't be buying formula for my son, and should instead try to breastfeed. Can you believe that it's been almost a year since we met? Let me fill you in on our life. Despite your lecture, I did buy formula that day. And, thanks to the formula, my son has thrived. The tiny, starving baby who was curled up against my chest as you broke my heart is now a vivacious, healthy 11-month-old. He gives kisses, plays with dog food (much to my dismay), loves high fives, and never slows down. He's perfect. And he is exclusively formula fed. What you didn't know when you made the decision to lecture me about my feeding decisions is that I was trying, harder than you could even imagine. I was taking supplements. I was pumping around the clock. My son was on my breast more than he was off of it. No matter how hard I tried, I couldn't make enough milk. In fact, I could barely produce anything at all. But I still tried. I was bleeding, exhausted, and more emotional than I've ever been in my life. ...and that's my point. YOU DON'T KNOW. You don't know what the new mom in the formula aisle is going through. You don't know what the mom with the screaming toddler in line at the bank is going through. How can you judge someone's parenting decisions when you are only seeing a snippet of their life? Honestly, it doesn't matter what my situation was. There are so many reasons that parents choose to use formula instead of breastfeeding; why should anyone, whether they choose breast milk or formula, have to justify the way they feed their child to a complete stranger? We can't win; we are judged for nursing in public, and we are judged for feeding our babies a bottle in public. It's ridiculous. And you're part of the problem. We shouldn't have to feel guilty about the way we feed our children as long as we are feeding them. I sometimes wonder whether I would feel less guilty about my inability to breastfeed if you had shown me a little kindness that day. If you had asked me how I was feeling, or told me how wonderful motherhood is. Instead, you made me feel insecure...like I was less of a woman for "choosing" to buy formula. Because you chose to lecture me about my feeding choices that day, I still find myself getting anxious when I buy formula. I look over my shoulder to make sure that no one like you is lurking there, waiting to inform misguided women about the dangers of using formula. I'm sure you didn't anticipate your lecture having such a lasting effect on me...maybe you should have thought before you spoke. I had so many things that I wanted to say to you that day. I wanted to tell you off, to tell you that you should never assume that you know what is best for other parents and their children. I wanted so badly to implore you to never again confront a new mother about her feeding choices. Because no one should ever have to go through the pain you caused me. But instead I just cried. And who could blame me? 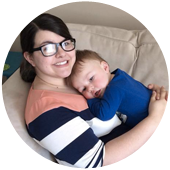 I was a first time mom, five days postpartum, recovering from major abdominal surgery, and my baby was starving. Of course I cried. Please, please, please think before you speak. As long as other parents aren't putting their children in danger, there is really no reason that you should intervene. Just because someone chooses to do things differently than you does not mean that they're wrong. My prayer is that your experience with me taught you a lesson. I hope that now, instead of lurking judgmentally in formula aisles, you smile at new parents as they read the ingredients on every box of formula in the store. I hope that you realize that those parents might be making one of the hardest decisions of their lives. I hope you bite your tongue when you feel the urge to chastise them. And I hope that you are well. Well said! Love you guys and am proud of you for being such a good mom. You're awesome. So sorry you had to go through that! I applaud you for what you have written and hopefully when people read it they will think twice before making assumptions about parent's choices for their children and take the time to learn about the situation before giving their two cents. It's sad how some people think they have the right to tell someone off like that.